The Power Lies Beneath! When the Toa are exposed to the strange energies of protodermis, they are transformed into the mighty Toa Nuva! With new powers, new armor, and new tools, the Toa Nuva are fully prepared for any threat to their island home. But will the power of the Toa Nuva save Mata Nui… or shatter it forever? Master of the molten lava! 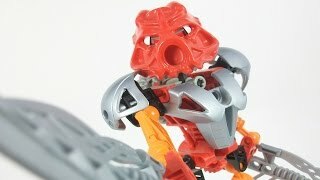 Tahu Nuva dwells deep within the Mangai Volcano, only venturing out to protect his people from the menacing forces that plague Mata Nui. His magma swords can be attached to his feet to make a lava surfboard, for lightning-fast travel down the sides of the volcano. Turn the wheel on his back to move his arms!